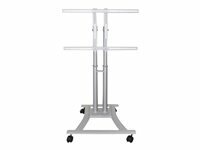 Cart for LCD / plasma panel, silver, screen size: 27"-70"
The NewStar PLASMA-M1200 is a mobile floor stand for LCD, LED or Plasma screens up to 60" (150 cm). With this product on wheels you have perfect flexibility to place the flatscreen where ever you want. The height can be adjusted between 80-120 cm. Cables can be placed in the column. Suited for flatscreens between 27-60" with a maximum weight of 50 kg and a maximum VESA hole pattern of 600x450 mm. Perfect for exhibitions, presentation rooms, class rooms and hospital!